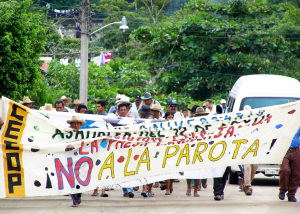 On Saturday 15 November, members of the Council of Ejidos and Communities Opposed to the La Parota Dam (CECOP) were attacked by armed men. The assault left five dead and seven women injured in the community of La Concepción. The communards called this “a planned act” and stressed that they would defend their lands. “This is a demonstration of how we are prepared to die for our land,” said one of the CECOP leaders at the wake for Celerino García Hernández in La Concepción, who died after being shot by construction workers and neighbors close to the extraction company Kimbar. 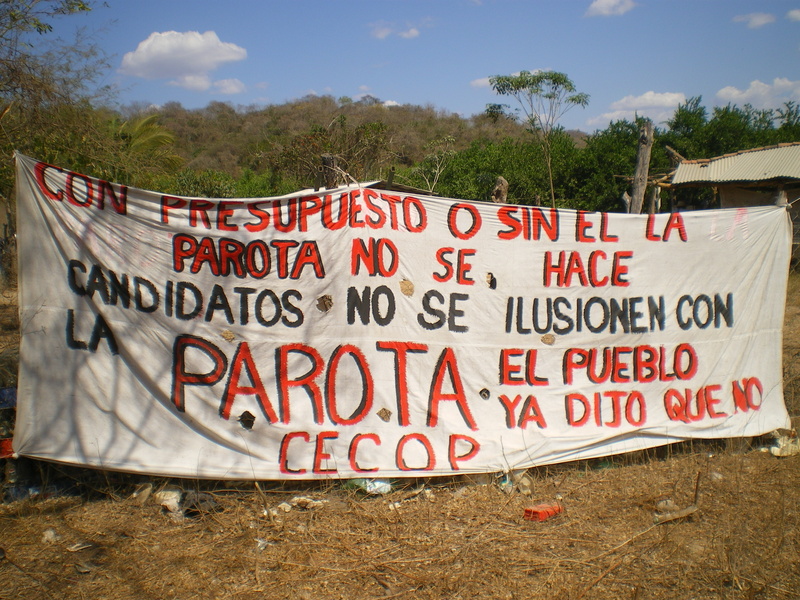 The confrontation took place in front of the justice house of the communal police which has been appropriated by opponents to La Parota in the community, resulting in the death of one CECOP member. The attackers, from La Concepción and Aguacaliente, also lost three to the attack. One of the CECOP members indicated that the attack was planned with anticipation, for it included four trucks, two of which were stationed just behind the attackers, so as to protect their rear. This CECOP member emphasized that the church bell was dismantled, such that when communal police and women were to the temple to organize the people, who on that day were celebrating the patron-saint of La Concepción, “the ball was missing, and it could not make sound.” They later found the ball in the white truck wherein one of the attackers died, the member explained. According to State Attorney General’s Office of Guerrero, the Special Prosecutorial Office of the State (FGE) began its investigations into the confrontation that very same day, 15 November. 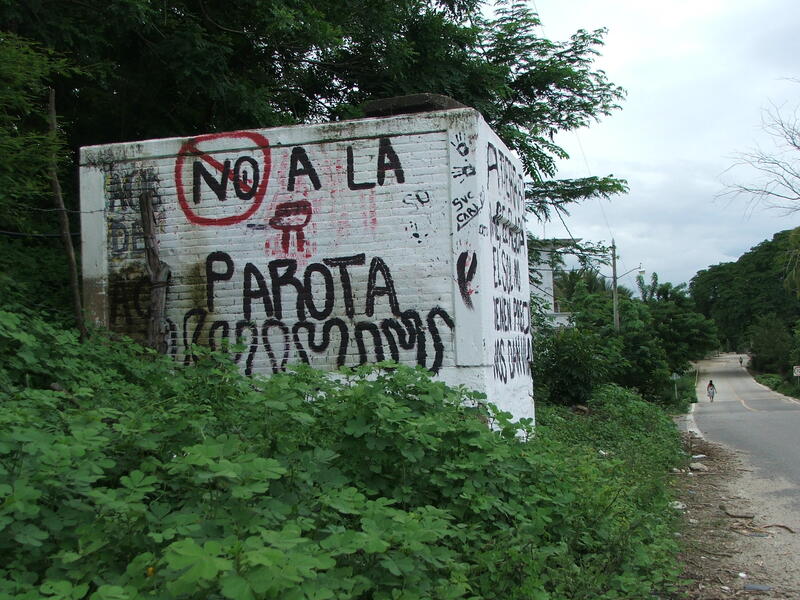 Taking advantage of the tragedies imposed by torrential rains, residents of Cacahuatepec (near Acapulco) have denounced that the government seeks to relaunch the project to construct the La Parota dam and arrest those communal leaders who oppose the plan. On 7 November, in the salon of the Republic of Guerrero House, President Enrique Peña Nieto announced a comprehensive strategy for the state of Guerrero which will see 30 million pesos invested in three primary axes for next year’s budget. Among the planned works, Peña Nieto announced the construction of a hydroelectric dam on the Papagayo River. Without mentioning it by name, the president most likely was referring to the La Parota dam, given that there is no other hydroelectric project slated for that river.